The Cape Town Atlantic Seaboard refers to Cape Town's wealthy suburbs on the west side of the peninsula. Areas such as the exclusive Clifton, Camps Bay and Llandudno have some of Cape Town's most sought after properties and whitewashed modern mansions and luxury apartments. These properties with their brilliantly blue swimming pools climb up the hillsides, while the pristine beaches are popular with the beautiful people. 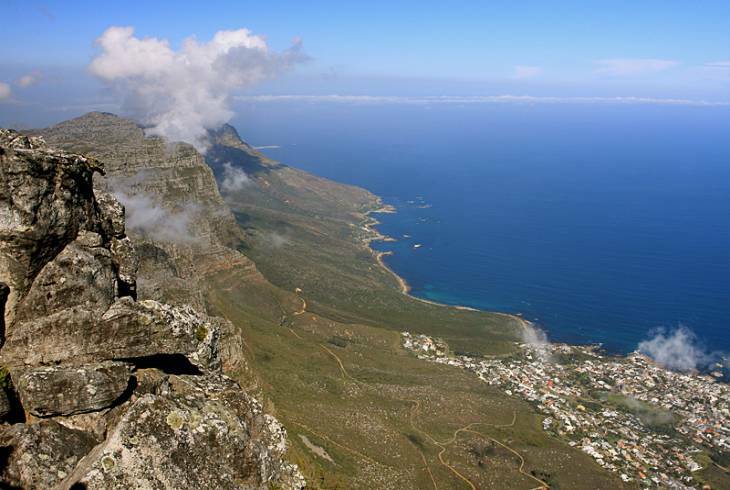 As you travel further south the road winds its way above the rocky shoreline and below the magnificent Twelve Apostles, the spine of mountains from the back of Table Mountain, before dropping into Hout Bay and the back end of the Constantia Valley, before continuing south towards Cape Point. The Cape Town Atlantic Seaboard accommodation offering is vast. From traditional Bed and Breakfasts and Self Catering to Hotel accommodation for those that like to be pampered. All options provide the perfect base from which to explore this region of Cape Town. The Atlantic Seaboard boasts a spectacular selection of beaches. If you take a drive along Victoria Road, the beautiful coastal road set against steep mountain slopes, you will enjoy views of the white sands of Clifton, Camps Bay, Llandudno and Hout Bay. Clifton is possibly Cape Town's most glamorous beach and has four adjoining coves that are accessed via stairways which descend between the luxurious bungalows. Camps Bay is a long, broad beach set at the foot of a magnificent series of mountain peaks. It is a popular choice for activities such as beach volleyball, surfing, or just soaking up the sun. The beachside road has a good selection of cafes and restaurants. Sandy Bay is Cape Town's unofficial nudist beach and is tucked away in a spectacular setting about 15 minutes walk from the car park. The beach is uncrowded and its patrons unpretentious. Cape Town, Atlantic Seaboard overview. Cape Town, Atlantic Seaboard Accommodation and Information.